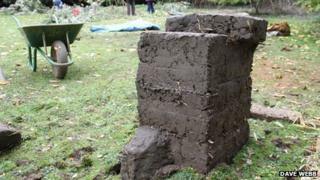 The first "buildings" on a £1bn Cambridge University development will be made from mud and straw. Artists are to create a scale model from material known as cob, representing the first phase of the University's North West development. The 75m-long model will be built onsite from top soil left over from archaeological excavations of the area. Construction of the actual buildings including 1,300 homes, a school and shops will begin later this year. The public artwork will be created by artists Nina Pope and Karen Guthrie and members of the public, who will be taught the techniques of working with cob during workshops. The mixture of mud, straw and water is a traditional building material in the West Country. "Whilst cob is easy when you know how, there are few opportunities to learn this skill hands-on in the UK," Ms Guthrie said. Work will begin on 28 April and is expected to take six weeks to complete. The project is funded by Section 106 developer money from Cambridge University. Outline planning permission for the full development, which will include 3,000 homes and accommodation for 2,000 postgraduate students together with research and community facilities, was granted in February last year. The 370-acre (150 hectares) development is being built on Cambridge University farmland between Huntingdon Road, Madingley Road and the M11.